Four months as Idaho’s public records ombudsman has taught Cally Younger that more work needs to be done to clarify and strengthen Idaho’s public records process. What’s been your biggest surprise? What didn’t you know before you started that you wished you had? I wasn’t really sure what to expect at all when I started, but I think I was most surprised at how interested the public was in the creation of the new position and office. I’ve had a lot of time to learn and get familiar with Idaho’s public records law since we created the position, so I don’t think there’s anything I wished I’d known before starting. What don’t people know about Idaho public records they should know? The Idaho Public Records Act is different than the Freedom of Information Act. FOIA requests are made to federal agencies. So when people reference FOIA to apply to a state agency they are referencing the wrong law. The applicable code is the Idaho Public Records Act. Also, some people have confused this act with articles of the state constitution. There is no provision governing public records in the state constitution. What should public officials know that they don’t? Public officials can be proactive by making commonly requested public information available on their website. This can help the agency cut down on duplicative requests and also save taxpayers money, because it takes staff time to research, retrieve, copy and provide that information. Most of the requests I get vary greatly. Requests to review denials generally involve a similar theme – individuals seeking public records pertaining to issues that have personally affected them, their loved ones or their employment. In contrast, the public records requests we receive in this office are usually broader in scope. Based on your experience, what do you think is the best way to handle local public records conflicts? Do you think it’s realistic that counties and cities will adopt the same model? Is there a statewide approach Idaho needs to be looking at? I think it depends on the volume of requests that a particular agency or local governing body receives. My goal this year is to update the public records request process. I strongly encourage counties and cities to follow the state’s example to the extent practicable. We certainly don’t want to dictate how they should proceed. … We’d definitely want to see more accountability in responding to public record requests at all levels of government, and I think updating the process is an important part of that. Have you identified or implemented any changes in the way the governor’s office and other offices under its authority process public records requests and retain public records? Yes. We are currently working on making it easier to make public records requests to our office. Soon, the public will be able to make public records requests straight from our website. There will also be a few technology updates internally that will make it easier to complete records requests. DEQ (Department of Environmental Quality) receives roughly 100 requests a year and they’ve really streamlined their system, so despite the volume of the requests they receive, they still respond to nearly every request in three days. My goal is to have all state agencies implement something similar. For some, it won’t be practical due to too few requests, but for agencies that receive lots of requests, it could make a huge difference. In some states, the public records ombudsman assists all state agencies. Do you think Idaho could benefit from having a statewide ombudsman? I think I could definitely be a resource to state agencies as they encounter new issues with requests. In April, David Hensley, the governor’s chief of staff, told Jeremy Pisca of the Newspaper Association of Idaho that he would “commit to working with you on legislation for the next session to codify a review process for state agencies and local governments prior to and/or in lieu of litigation.” Is the governor’s office still committed to introducing this legislation in the next session? Yes. We actually had our first meeting last month to talk about our goals for this session. I am hopeful that we can add that review process and also clear up some ambiguities in the law. Are you considering any legislation to clarify or strengthen Idaho’s public records laws? Yes, particularly after the confusion our office encountered recently about what types of records in our office are actually public. For instance, our office was recently criticized for not releasing records (the applications for a State Board of Education appointment) some in the media assumed were public, when in fact they contained personal information that we legally weren’t allowed to disclose. So balancing the public’s right to know with an individual’s right to privacy is where we probably need to focus next. More than 20 State Board of Education applications were destroyed. Have any changes been made in policy or procedure following that? Yes and no. The request for the applications allowed us to go back and look at what the relevant statutes actually said. Our internal policy for all board positions was to keep applications only until that candidate was eliminated from consideration. Idaho Code 9-340C actually says that personal information, including applications, cannot be released without written consent of the applicant. Further, that statute only requires that we release the names of the top five finalists for each board position. So despite some media reports to the contrary, we actually went above and beyond what the law required. We released that additional information because of our commitment to transparency. We also made this clearer on our website in our notice to potential applicants, so that they will know their personal information is safe and will not be kept in our office any longer than required by code. So while our office strives to be as transparent as possible … we have to balance that desire with protecting personal information of private citizens. Utah is one of several states with a public records ombudsman. But unlike Idaho, which has litigation as the remedy for disputes over public records, Utah has a state records committee that hears appeals. The Legislature created the position in 2012 to help the public and government employees understand and comply with the law. The program has one employee: Rosemary Cundiff, who is appointed by the state archivist. During the 2012-2013 fiscal year, Cundiff provided 1,100 consultations. Of these, 585 were queries from the public and 515 were queries from government entities. Since Cundiff began mediating disputes, the number of appeals heard by the Utah records committee has decreased from 26 in 2012 to four in the first six months of 2013, according to the ombudsman’s most recent annual report. Cundiff is compiling her 2013-14 report. She said the number of consultations increased to about 1,600, a 45 percent increase over the program’s first year. “If being busy is a measure, it was a good idea,” Cundiff said. The state is now working on creating an online portal for filing public records requests. The Legislature funded the effort, which includes all state agencies. Eventually it could be expanded to include all local governments as well, Cundiff said. Cynthia, a Statesman reporter since 2005, has been named reporter of the year by the Idaho Press Club, largely for her watchdog reporting. She’s a graduate of Capital High School and the University of Oregon. Her family has lived in Idaho since the late 1800s. Most of her time is spent answering questions by phone – she’s received just two written complaints – and trying to figure out what needs to happen to the state’s public records law to make it work better. She’s surveying state agencies and meeting with stakeholders in advance of the 2015 Legislature, and recommending potential changes to her boss, Gov. Butch Otter. She’s found examples of what works really well, such as the Idaho Department of Environmental Quality’s streamlined process. But she’s also found shortcomings, such as vague statutes and a lack of modernization and enforcement. Citizens are supposed to have unfettered access to the records of public agencies in Idaho, but the reality is that navigating exemption rules, privacy laws, retention guidelines and individual agency policies can make accessing public records an onerous endeavor. And the law’s only enforcement mechanism is a citizen-initiated lawsuit. If a journalist or other citizen disagrees with the government’s denial of a record, it’s up to that citizen to go to court to enforce the law. “I think the biggest shortcoming is that litigation is the only remedy for a requester, which in many cases can be cost-prohibitive to pursuing withheld records,” Younger said. 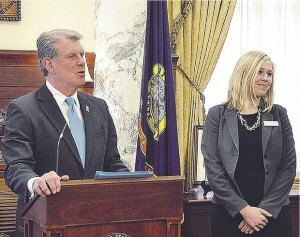 Otter worked with the Newspaper Association of Idaho to create the position. But before Otter announced it, the plan was revised to limit the ombudsman’s powers. Additionally, Younger may not order a state agency to release records. And her oversight does not extend to city or county governments. Changing the public records laws to give an ombudsman power to review denials by state agencies or other levels of government would require legislative action, Otter’s advisers concluded. Otter tapped staff attorney Younger to fill the role, which she said has been taking about a fourth of her time. In addition to ensuring that public records policies and practices are consistent, she is surveying state agencies to identify issues and ways that legislation could reduce conflicts and improve transparency. Younger is compiling concerns and complaints from individuals about agency policies, processes and decisions, and will report that information to the governor annually. “It is the first step in the right direction,” said Jeremy Pisca, lobbyist for the Newspaper Association of Idaho. The two written complaints Younger has received came from a citizen trying to obtain records from a Boise charter school and a citizen seeking records from the Clearwater County sheriff’s and prosecuting attorney offices. She told the complainants that those agencies were outside her jurisdiction. “Your situation highlights the need to examine this process and work towards improving access and transparency to public records,” Younger wrote to one in May. But Younger said she benefits from learning about the public’s experiences with other agencies. “It gives me insight into things that may need to be changed legislatively,” she said. In Idaho, citizens are solely responsible for enforcing the state’s public records laws. If an agency wrongfully denies access to a public record, the Attorney General’s Office does not have the authority to prosecute violations. If a state, county, city or other local government denies access to public records, a citizen’s sole remedy is a lawsuit, which can be a costly and intimidating process. And if the court determines that a request or a refusal to provide public records was frivolously pursued, it can award costs and attorney fees to the prevailing party – another risk a citizen takes. The deck is stacked in favor of agencies that want to deny or censor records, said Bill Manny, the editor who supervises the Statesman’s government coverage. While a citizen has to hire a lawyer and go to court to get a government agency to comply with the law, the government controlling access to information usually has a lawyer – or a team of lawyers – on staff, at public expense. “So the newspaper or the citizen has to decide which battle is worth fighting – and paying for,” said Manny, who noted that the Statesman has been denied records as basic as county telephone numbers and contracts for landfill garbage-burning plants. The newspaper also has been denied draft city ordinances based on lawyer-client privilege, he said. And he said information released on crimes, victims and accidents varies widely from police agency to police agency, depending on department policies. Manny pointed out that most records conflicts originate at the city and county level, where even an ombudsman with broad state agency authority would have no say or sway. Younger said she’s aware of the concerns over enforcement and would like to investigate an alternative to litigation, including possible legislation to establish an independent review process. Record retention is another gray area. State law says which records cities, counties and other local governments must retain and for how long. But there is no umbrella law that dictates state agencies must retain certain records for a specific amount of time, said Idaho State Historical Society Executive Director Janet Gallimore. Each agency sets its own guidelines, which are not compulsory or enforceable. For example, the Idaho Department of Correction keeps emails for six months, but the governor’s office lets each employee decide which emails to archive. The attorney general does not have a time-driven policy for keeping general correspondence in that office, but it does for correspondence related to legal work with clients. All state, county, city and other local governments operate under the Idaho Public Records Act, but flexibility within the law means policies vary. “So if a citizen makes requests across several agencies, the prices, the response time and the way in which the records are provided may be different,” Younger said. The principle behind the law is that processing requests is part of the public business and already funded by taxpayers, according to the attorney general’s office and its Public Records Law manual. Agencies may not charge for the first 100 pages of copies or for the first two hours of labor processing a public record request. For copies or labor in excess of these limits, agencies set their own fees – and those vary. The city of Boise and the governor’s office charge 5 cents per copy; Ada County charges 1 cent. Some agencies charge per page even when providing documents via email or disc. Labor fees also vary. The law says they must be charged at the per-hour pay rate of the lowest-paid employee qualified to process the request. Some agencies, such as the state controller’s office, charge rarely if at all for public records. “It is the citizens’ information. It is their money,” said Chief Deputy Controller Dan Goicoechea. Controller Brandon Woolf noticed that many of the public records requests his office was getting were for state employee salary information. So shortly after taking office in 2012, his office created a website – transparency.idaho.gov – with all state employee salary information. Younger, too, wants to modernize the public records process, making it easier to request and receive records electronically. She and Pisca cite the Idaho Department of Environmental Quality process as a possible model for other agencies. Younger recently sent a 20-question survey to all state agencies and met with members of the Newspaper Association of Idaho to identify potential problems and any necessary legislative tweaks. “We are in the preliminary stages of trying to identify what all those problems are and the best way to go about correcting them,” said Pisca. “Rome wasn’t built in a day,” he cautioned. Any changes would need to be incremental and the process could take years.